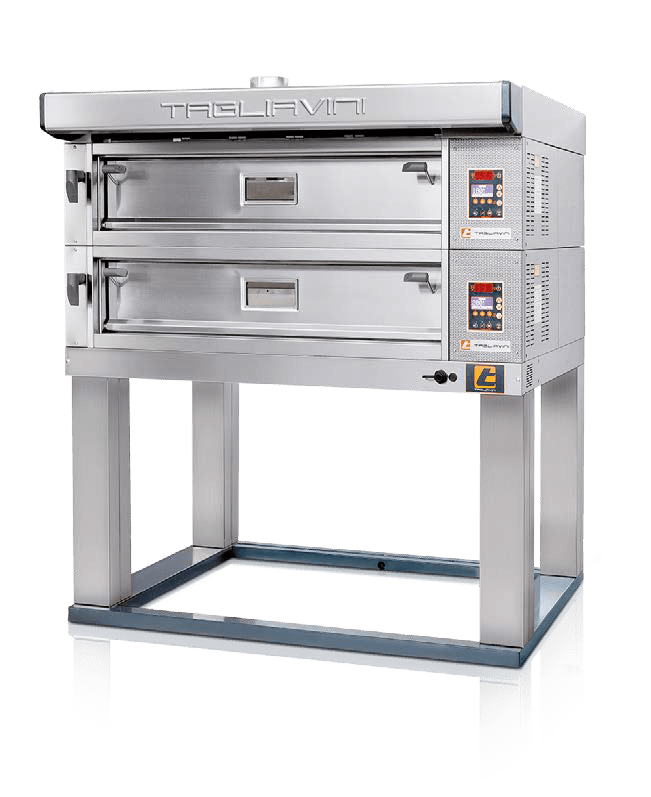 The Tagliavini Modular Pizza is an energy efficient, electric modular deck oven suitable for pizza production. This easy to install oven offers bakers added flexibility by being able to individually control baking temperatures for each deck. For more information, please call: 800.682.8203 or click here. 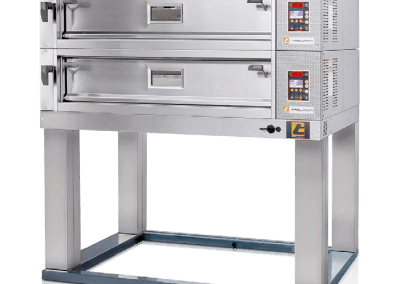 This oven is highly configurable and can be built to order. This includes control over the number of decks, pan/tray layout (number of trays deep and wide), and a support base with or without storage, proofing cabinet or proofing cell. This oven is good for bread and rolls both small and large and everything in between. 1 oz – 4 lb. 6.5 oz | 30g – 2kg. SMART Digital Control Panel – capable of controlling baking temperature, baking time (with alarm), lighting, percentage of power used, power distribution between deck ceiling and floor, and steam delivery. The panel also has an LCD display dedicated to each deck and features a weekly start-up program (PROSET) and storage for up to 10 baking programs. Capable of being installed into the SMART digital control panel, this allows the oven to reach a higher temperature in less time. This oven features stainless steel construction for a durable, sleek, modern, and easy to clean finish. The oven deck is also made of refractory quartz material. Designed to be accessible and easy to maintain. This includes control pannel access, front access, etc. Depending on both your door size and oven size, this oven can be purchased pre-assembled for even quicker installation. Alternatively, each deck can be delivered fully assembled and ready for stacking. Using reduced energy consumption technology, this oven consumes up to 30% less energy than similar electric deck ovens. This oven provides an even bake batch after batch. Reinforced heating elements are strategically placed both at the top and bottom of the baking chamber. This helps ensure gentle and even heat distribution. Steam is controlled via the digital SMART control panel and manual dampers. Each deck has its own self-contained heating element system and control panel. This allows each deck to have a different temperature at the same, enabling you to bake different products at the same time. Automatic steam exhaust valves can be installed as oposed to the standard, manual damper system. Enables you to volumetrically measure water that is distributed to the steam generator. An independent steam generator can be built into each deck and can even be added post purchase. All the features of the traditional SMART digital control panel with the added ability to store up to 30 baking programs. 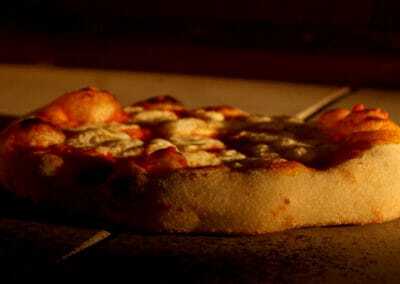 Ability to purchase either a manual or automatic oven loader that is built directly into the oven. A proofer can be equipped within the support base or as a standalone proofing cell. Both can be configured with wheels. The proofer features: heating, ventilation, and humidity control system settings that are configured via a control panel, capable of storing up to 9 proofing programs. V-molded floor with a central drain for easy cleaning and washing of the proofing chamber. iBake is a complete touch screen based control panel that features the PROSET weekly starter function.  iBake Saver: designed for optimal energy savings. The baker’s entire power supply can run through the oven and be monitored. iBake Pro: store up to 100 baking programs. iBake Full: includes both the iBake Saver and iBake Pro features. 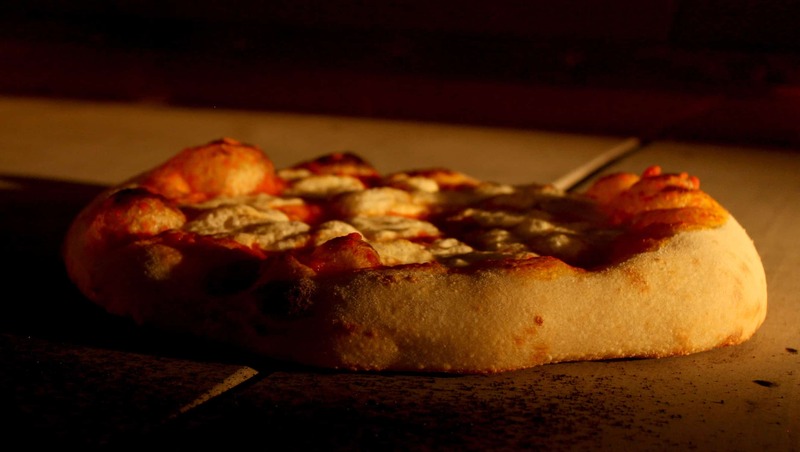 An industry-leading electric deck oven that is also suitable for pizza!